While the gloves provide high level cut and abrasion resistance, some cautions should be noted. 1. This product is NOT designed to withstand the puncture of sharp tips nor the force of power driven blades saws and tools. 2. REPLACE them if torn or damaged. 3. NO gloves are 100 % cut proof, be careful when performing risky tasks. SOLD PER PIECE: For added comfort a nylon glove liner is included free-of-charge to wear underneath. Package contains one stainless-steel glove and one white nylon glove for SINGLE hand-NOT SOLD BY PAIR. Please confirm the size before ordering. AMBIDEXTROUS&COMFORT: Glove fit either left or right hand. Seamless-knit steel mesh conforms to hand better than chain-mail competitors. Medium weight. Excellent dry & wet grip. 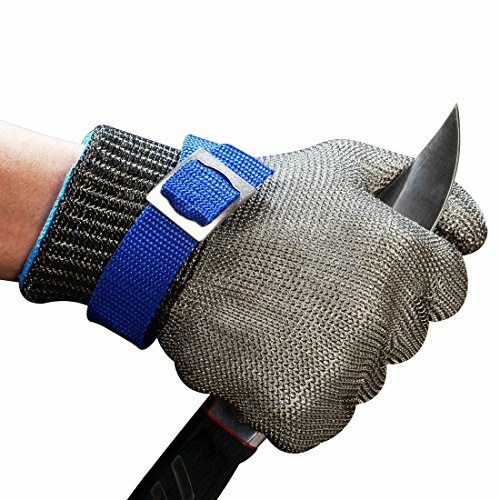 ULTIMATE PROTECTION: High level Protective gloves, CE-5, ISO-F, protect your hand from slashes and cuts when cutting, chopping, slicing etc. DIRECT FOOD CONTACT: FDA compliant materials. Corrosion resistant, safe for grocery, poultry, meat processing. Washable using the 3-sink method. REPLACEABLE BUCKLE: Fasten the glove in case it slips off. If you have any questions about this product by Schwer, contact us by completing and submitting the form below. If you are looking for a specif part number, please include it with your message. Anaheim 1030 Whirlaway/Ge Sink Flange Assembly, English, Plastic, 4.60 fl. oz., 1" x 1" x 1"